The Whale and Dolphin Conservation Society (WDCS) has recently chosen to start a campaign against Dolphin-Assisted Therapy (DAT). Using a recently published paper, they claim to have scientific evidence that DAT is ineffective. As the founding Director of the Cetacean Studies Institute, founded in 1996, and long-time researcher into the effectiveness of Dolphin-Assisted Therapy (DAT), I feel compelled to comment. The review of DAT research cited by WDCS written by Marino and Lilienfeld has many errors in it. Titled “Dolphin-Assisted Therapy: More Flawed Data and More Flawed Conclusions”, it is itself littered with flaws. Without any clear definition of what Dolphin-Assisted Therapy is, the Marino-Lilienfeld paper makes unsupported accusations against well-developed and well-proven therapeutic programs of therapy that include dolphins. It does not adequately differentiate between real DAT programs and “swim-with-dolphins” programs. The paper suggests, for instance, that any person swimming with dolphins is undertaking some kind of intentional therapy. It cites research having to do with injuries sustained by people in commercial swim programs, and it cites only one side of the debate about whether diseases can be transmitted between dolphins and humans as part of its basis for describing DAT as an “unsubstantiated intervention”. Yes, DAT is, so far, unsubstantiated by the research cited by Marino et al.. Does this mean that it is ineffective? The main issue here is whether DAT has a positive and long-lasting effect on the lives of patients and their families. Instead of addressing this question, which would necessitate actual research, extensive interviews, arranging for standardized measuring instruments to be deployed to discover and document changes, and a host of other expensive and time consuming research, Marino and Lilienfeld have taken the safe arm-chair route. They have reviewed some of the very few research papers ever published to see if they can stand up to an extremely rigorous analysis of their scientific validity. Reviewing the validity of research is not the same as doing research. We could all benefit from a review of the available research and suggestions about how it can be performed better. If this had been their intent, Marino and Lilienfeld's review could have been truly useful. Instead, they selected papers to critique and pursued a predetermined mission to condemn DAT -- without doing any research themselves into the effectiveness of Dolphin-Assisted Therapy. In our many years of studying DAT, visiting facilities, interviewing therapists, patients, family members, trainers, doctors, medical technicians, as well as filming dozens of sessions, collecting patient stories, and operating a small Wellness Program ourselves, we have seen many wonderful results. Literally thousands of families have had their entire family history changed for the better through the effectiveness of good DAT programs. 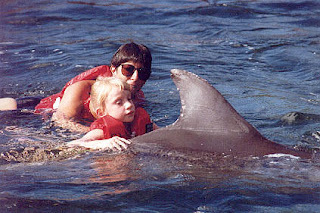 To date no one has created an accurate definition of Dolphin-Assisted Therapy. However, just as the Supreme Court Justice said, “I know it when I see it”, one can visit some of the DAT programs around the world to see what it is. 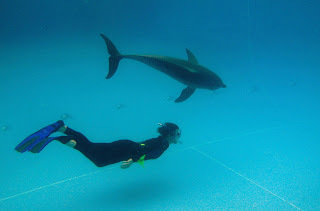 We recommend Island Dolphin Care, in Key Largo, Florida (www.islanddolphincare.org) as the most professional, effective, and long term program, under trained medical professionals, run as a non-profit organization, as the model for high standards. The results -- improved lives -- are the means by which to evaluate DAT. 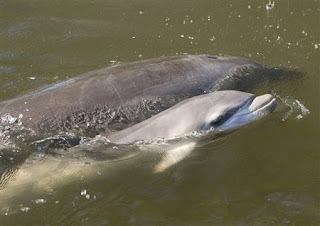 Our program (www.dolphintale.com) here in Australia works with rescued dolphins and their progeny. These dolphins would be dead, long ago, if they had not been rescued. Now, as dolphins living among humans, it is important that they have life experiences that are enriching, stimulating, and as safe as possible to help them maintain their health. We know that our interactions with these dolphins are a real benefit to them as well as a benefit to those people who swim among them. DAT needs to be investigated more fully. Research needs to be done by competent, well-funded scientists, who have no bias or agenda to push. Until this is done, we will have ill-informed campaigns such as the WDCS campaign, and the misdirection of papers such as the one by Marino and Lilienfeld. Recently we were in Florida, visiting our friends at SpeakDolphin.com, where we were hosted to present an evening of Dolphin Embassy news and updates to a community of old friends, new friends, and a variety of local experts on dolphins and whales. We had a wonderful time sharing the news of our latest work, and viewing footage from several dolphin and whale researchers. While in Florida, one focus was to catch up with the team we have been collaborating with on a special research project. This project was focused on a stranded dolphin, her conditions, and the birth of her calf. Castaway was stranded on Castaway Beach in south Florida. She was a single stranding, an unusual event. When she was examined, it was discovered that she was unusual in other ways. She was pregnant, and she was deaf. How a dolphin becomes deaf is not fully known. She may have suffered ear infections -- she had none at the time of her stranding -- she may have been born deaf. Most likely she was the survivor of infection. Her pregnant condition may have forced her to choose to head toward land, as her deafness probably left her feeling very vulnerable. But then, what do we know of the choice to head toward shore by a dolphin? In any case, she presented both huge challenges and some special opportunities for research. A team was formed to address her situation and she was transferred from the original stranding organisation's facility to a facility we have become familiar with, the excellent Marine Mammal Conservancy, on Key Largo. Because of her situation, her questionable health, and the need to keep her isolated from other dolphins, we knew that her infant was going to be without an essential element in its development in the womb -- no sounds from other dolphins, or from Castaway herself. Castaway made some sounds, but similar to deaf humans, there was little dynamic range or variation to her sonic output. We decided to enrich her environment by providing supplemental dolphin sounds. The first and easy part was to get recordings from Dolphins Plus, a few miles away, of their pregnant dolphin and the others who shared her pool. These recordings were played to Castaway -- and her growing fetus -- in two daily sessions. The next step was more difficult. We wanted some kind of live interaction for the new infant. We arranged to have a telephone link set up to provide a live and open phone line between the two facilities! This was widely reported in the national and international media. We wondered: "How does a baby dolphin gain it's language? ", "Where does the signature whistle originate, from the young calf, or from the mother? ", "How will a mother communicate with her calf without sound? ", "How will a deaf mom affect the calf in it's feeding? ", and many more questions. We decided to set up 24 hour video and sound recorders to watch the process. Research continues with Castaway, but the opportunity to watch the process of language acquistion by a new calf will have to await another opportunity. Will Castaway become pregnant again? Time will tell. When we visited, we were able to go to the MMC, see the amazing birthing pen that was built, and then go to Dolphins Plus, where Castaway now makes her home. We were invited to swim with her. This was truly a highlight in our 25 years of dolphin interaction, and literally hundreds and hundreds of dolphin swim encounters. What an amazingly different dolphin she is. Castaway can be, with all due respect, be thought of as a sort of "human-like" dolphin, in that she depends entirely, as we do, on her sight and touch in the water. She was more than friendly...she approached right away and began to caress us. She swam beside us, so close we had to backpedal to be able to take pictures. She gazed into our eyes, closely and steadily. Her gentleness -- she is a very large Atlantic Bottlenose Dolphin, at least 2.5 meters long -- and presence were startling in their power. We were deeply moved by her tender play and seeming fascination with these new people. After so many months of having humans lift her, measure her, help her thru a difficult birth, the loss of her calf, and all the odd things we humans do when trying to care for dolphins in distress -- hydration, injections, massage, staring at them night and day -- after all that, she was so gentle and loving, so very close and curious about us. Thank you, Castaway, for one of our most amazing encounters. We will continue to visit you, to spend time contemplating the destiny that brought you to the human world, and the role of Ambassador that you play. We have just begun our Summer 2007 Dolphin EDventures Wellness Program (see www.dolphintale.com for details). After a brief and intense trip to the US, which included a visit to Florida where we had some special time with Castaway (see the next blog entry), we have returned to our important work here in Australia -- we are enjoying one of our favorite activities -- introducing new friends to our old friends, Buck, Zip, Calamity, and Bella. 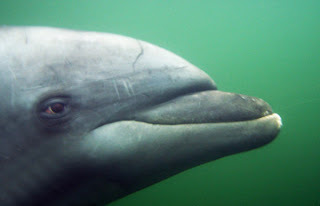 The dolphins who live at the Pet Porpoise Pool are unique, and their circumstances have largely contributed to this. Two were rescued from dire circumstances in which they would, no doubt, have died. After months of recovery, they were deemed to be unable to survive at sea, and have been given a promise of a lifetime of excellent care. If any of you have ever tried to give a dolphin a fine and healthy environment in which to live it's amazing lifestyle, you will know what a huge promise this was. With Buck, who has been living at the PPP for 36 years, this has proven to be a very big promise. For Calamity, whose tail flukes were nearly severed, her life in the pools at the PPP have been her only chance at a happy and safe life. Calamity has recovered so well that she has given birth to Bella. Bella, born in July of 2005, has delighted us since we first met her. Swimming with her since she was about 3 feet long, it feels like we have been partners in her learning and growth, sort of like Aunt and Uncle. And Zip, also born at the PPP, 18 years old, is a fine example of a healthy and playful dolphin. He specializes in ball play and can make anyone say "Wow" when he puts on his display. Our return to our season of dolphin swims is very much appreciated by us, and we believe, by the four dolphins. We provide a very real kind of enrichment to them, living in the reduced circumstances of human-managed pools. We play, we dive, we float and listen, we stand and receive their attentions. We do not ask them to perform any behaviours. Instead, we believe that most people want as authentic an experience of dolphins as this circumstance can allow, and we support that. We do not want the dolphins to have to "work for us", so we simply play and watch. And without exception, every guest we have ever had (hundreds so far) has reported an amazing and delightful experience. Thanks for having us, Friends, we are so happy to be back!